What follows is a stream of consciousness. No set plan as I write, just going through my thoughts tonight 6/12/2016. It happened. I can’t believe it happened. My city is now forever changed. But I hope we change for the better. 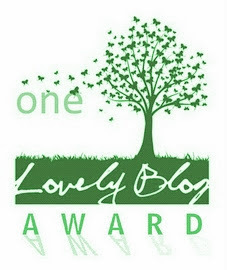 More love, more acceptance, more working together. This isn’t to say that my city lacks these things. But life is about growth and evolving. We can always improve. I have my shortcomings. We all do. The hope is that we learn, we grow, we rise, and climb. I woke up Sunday morning to my mother walking into my bedroom asking if my friends who had stopped by the night before were okay. These dear friends went out to a nightclub in Orlando on Saturday night. I figured Pulse was not where they went. I rolled over in my bed, groggy but feeling jolted awake. With my phone in my hand I, like so many people, turned to social media to learn what I could. Thankfully I was able to quickly learn that my friends were safe. The previous morning I awoke to the news of Christina Grimmie. The Plaza Live is a great live music venue that I’ve visited over the years, making great memories each time. I am taken aback and stunned that this venue is now the scene of such a tragedy. That’s the challenge for me….. my beloved city, a destination loved by so many people around the world, has faced such tragedy back to back. We are a young city, by comparison, our history is short. The vast majority of residents in the Orlando area and suburbs are not from here originally, we natives are rare. This makes for a unique culture. So many people travel here to live out their dreams. This city is enchanting. Attracting people from around the world. We welcome everyone, warmly and with hospitality. I work in Downtown Orlando. I visit at least one of Orlando’s theme parks practically every weekend. So many people I love and care about work in the theme parks or visit them frequently. The likelihood of something happening to me or someone I care about is pretty high. I was barely into my 20’s when the terrorist attacks of September 11, 2001 occurred. From that point on I have tried not to take a day, a moment, friends, family, life for granted. Today I saw messages of love and support pour in from all over the world. Hearing “Orlando” fall from the lips of the President of the United States, giants of theater on the Tony Awards, and other prominent figures from around the world is surreal. This is my home. One of the many things I saw today are images on social media of theme park employees showing their love for Orlando. The theme park community is a special one. I do not know the original source of this photo below, but it is precious to me. 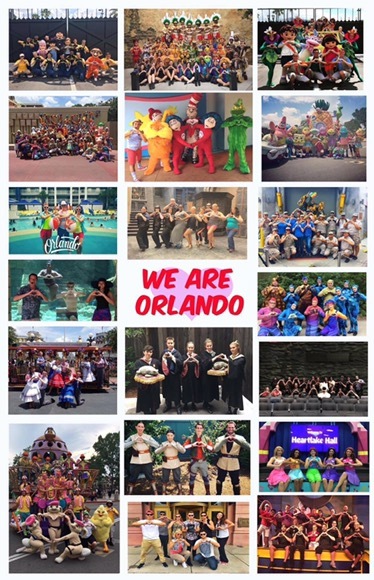 Performers and staff members from all of Orlando’s major theme parks, normally seen by the business world as competitors, came together for this photo collage. It is a special moment. 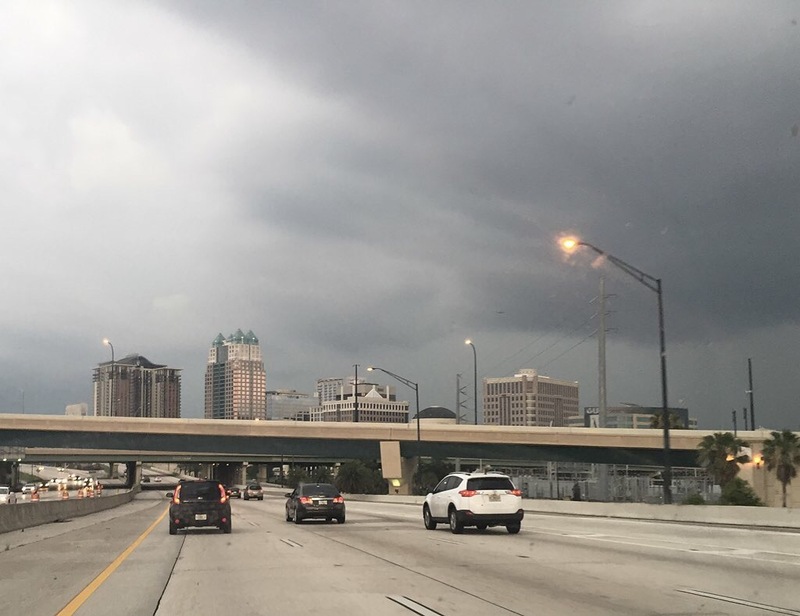 In the afternoon and evening, storms rolled through Central Florida. That didn’t stop people from gathering at vigils or finding other ways to show love and support. We will weather the storm. This may not be the most prolific piece I’ve written (not sure I’ve ever written something prolific, actually), but I have a platform. No matter its size or weight, I wanted to get my thoughts out on my platform. I love my city. My community is beautiful. I have many thoughts on what needs to change in our country, but that’s not what I want to express today. Orlando is a city of love.